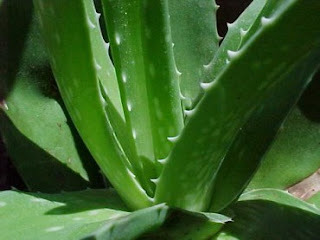 Many people in our neighborhood, it was not aware of and understand how the benefits of the aloe vera plant. They still take advantage of this magical plant only as ornamental plants in their home. Some of them, there is also the use to care for hair health. But still very few of them are aware that aloe vera can also be beneficial to human health. If we often see ads on television, then we will often get information that Aloe vera was very beneficial for healthy hair and skin beauty. Besides being used for body treatments, plants have a name Aloe barbadensis Milleer also good for twists and bruises heal. Aloe vera contains vitamins, minerals, and amino acids. Aloe vera comes from the Canary Islands, or west Africa. Its efficacy as a cure has not been widely known by the public. However, not all types of aloe vera plant is safe to consumed by humans. Only a few of them are allowed to be consumed. Today, aloe vera can even be utilized and consumed in the form of fruit juice. But for fruit juice consumption through it, need to find another more information regarding safer or not consume aloe vera juice. We need to ask the doctor. Specifically my own, never drank aloe vera juice. Aloe vera is one of the world's best-selling 10 plants are very potential to be developed as a medicinal plant and raw material industries in many developed countries. Aloe vera can also be processed into herbal products for health. We as lay people should also have to learn, that many herbal plants around our house that is so beneficial to our health. And if we want to, we can also cultivate these plants to produce economic value. Regarding the benefits to the hair, of course, thick hair shiny and healthy, it is a dream woman. Smearing hair with aloe vera sap, is a hereditary secret used by women in Indonesia. The trick, take 2 midrib aloe vera and wash and peel. Rub the fruit of the scalp that has been washed in the afternoon. Wrap the fabric. Aloe vera plant can be processed into culinary products. Aloe vera at least can be processed into drink fresh, lunkhead, tea, jelly, crackers, and flour. If we love to cook, then we will be more familiar with onion leaves or leeks. In Indonesian society, leeks are added to foods such as meatballs, martabak eggs, vegetable soup, and soup. Leeks have a very specific scent, so every dish that was given leeks, will have a fragrant aroma and certainly more delicious. Besides being known as one of the dishes, leek it also has many other benefits. Let's take a deeper peel any benefits from the leaves of this one. Besides contain calories, protein, fat, and carbohydrate, it turns green onions also contain vitamin A and vitamin C. It is quoted on the Food and Nutrition Handbook 1 Recearch Center Manila (1964). Onion leaves can lower blood sugar levels. 'Leaves magic' this one can also help the body's digestion. For those of you who are experiencing flu-like symptoms, leeks can help heal. Leeks also improving blood circulation. Onion leaves have active ingredients that have the power to kill the bacteria (as antibiotics). By eating leeks, able to facilitate the growth of body cells. 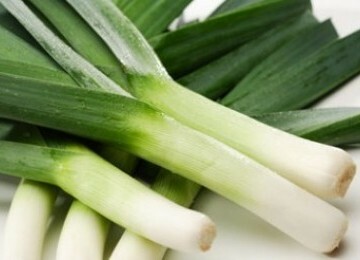 Leeks can also remove mucus in the throat, eases digestion, cure rheumatism, anemia, difficulty urinating, and swollen. Leek roots can be used to treat intestinal worms (roundworms) and nausea. -Seri Budidaya Bawang Daun. Bambang Cahyono. 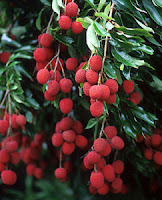 I am among those who like to eat fruit, but for lychee fruit, not too common to be consumed, especially in my country. Yet if we look for references related to this fruit, there are so many benefits that we can get from this fruit. People generally consume lychee fruit already in processed form. Suppose that given in the form of bread lychee fruit topping. Lychee fruit contains many minerals that are needed for body growth and bone formation. The mineral content owned lychee fruit are calcium, phosphorus and magnesium. Fruit lychee (Litchi chinensis Sonn) derived from Kwantung and Fukien province in South China. In 1873 the plant was spread to Hawaii, then to Florida, USA in 1883. Kwantung and Fukien province in China known as the largest manufacturer of lychee fruit, followed by India and other countries. Lychee fruit has a unique taste and high economic value. In tropical countries like Indonesi, a plant has started to try cultivated in Bali (Gianyar, Tabanan, Badung) and Cianjur. Lychee grows well in cool areas. These plants need plenty of water but were not flooded. Lychee fruit has a characteristic red-purple color after cooking, and color hjau while still raw. If you notice, the view outside a little like strawberries. The content of sucrose and glucose on lychee fruit is also quite high. Therefore, eating lychee fruit at night can increase energy reserves for the next day. Not only that, lychees also good for beauty. Consumption of lychees can refine skin, enhance blood and restore stamina. Lychee is also known to prevent the growth of cancer cells in the body. From this research, lychees contains flavonoids which proved highly effective against breast cancer (as quoted on Indiatimes). Lychee is also a source of vitamin c, vitamin C can fight heart disease and cancer. Vitamin C is also good for bone and tissue..
Lychee is a fruit with a very low fat content. Thus, the consumption of lychees good for someone who is on a diet. Besides lychees also good for people who are in a weakened condition and good for the elderly. When choosing lychee, select those with a firm shell that has no cracks. It is best if the fruit is still attached to its stem. The fruit's colour should be pink or red but never brown. Brown lychee are overripe and will not be as tasty. Papaya is a fruit rich in benefits. In addition to the fruit that contains vitamin C, the leaves can be used for vegetables. My mother loved to make vegetable using papaya leaves. It feels a bit bitter, but if we can mensiasatinya with certain tricks so it was not too bitter. In addition to delicious, papaya is also rich in enzymes, vitamins, and minerals. Nutrients in the fruit called latin Carica Papaya, among other antioxidants such as beta carotene (vitamin A), vitamin C, vitamin B complex, flavonoids, folate and pantothenic acid. Papaya also contains many minerals, potassium, magnesium, and fiber. These nutrients makes papaya is very beneficial to health. While nutrients in papaya is also proven to improve heart health (cardiovascular) to prevent cancer. The fruit is also low in sugar, so it's good to be consumed by diabetics. 1. Papaya can influence human growth hormone, which can help increase muscle tone and reduce the accumulation of fat in the body. 2. Being able to boost the immune system. 4. Can reduce the risk of emphysema in smokers and nonsmokers active. 5. Papaya can help arrangement of amino acids and helps in detoxification of toxins from the body. Thus, the immune system is increased. 6. Papaya helps improve sperm quality. Papaya proved significantly in helping the process of male fertility. By taking vitamin C contained by papaya as much as 500 milligrams per day, so the men can increase sperm count, stimulating a more fertile, and-most importantly-accelerating movement of sperm, which in turn accelerates the occurrence of pregnancy. 7.Papaya is a fruit that is very well serve as a source of antioxidants, which can be relied on to get rid of free-radicals trigger cancer, as papaya contains vitamin C and carotene in amounts quite a lot. 8. Papaya has antiseptic properties and can help prevent the development of bacteria that can harm the intestines. In addition, papaya helps normalize intestinal pH, so the situation becomes normal intestinal flora. 9. Ripe papaya can be used to cure dysentery and rheumatism. 10. Substance contained by papaya papain can break down foods that contain protein, composed of amino acids forming the character autointoxicanting, so automatically eliminate the formation of a variety of unwanted body substance, which occurs due to improper digestion. Thus, we will be free from epilepsy, hypertension, diabetes, arthritis, and constipation. Talking about the papaya fruit, I remembered the experience of time small. I along with my friends loved to take a ripe papaya fruit neighbor's. Do not imitate yes, because this is just juvenile delinquents. Or even the papaya fruit we use for bait catching birds. By creating a kind of trap in which feedback is given in the form of papaya fruit. So hopefully this article useful.